Acrylic rod is available in a range of sizes and diameters in both clear and coloured finishes. Round and square plastic rods are lightweight with high impact strength and suitable for both indoor and outdoor use. 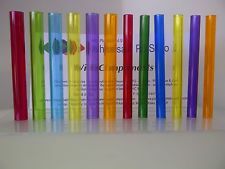 Order Perspex® rods cut to size. Acrylic round rod is a versatile lightweight material with high impact strength. Available in a wide range of diameters it can be easily worked for use in many applications. Extruded acrylic rod has over ten times the impact strength of a glass equivalent. Its hard wearing properties make it a popular material for many applications. High in strength yet half the weight of glass. Extruded acrylic rods are weather resistant and therefore suitable for both indoor and outdoor applications. Clear acrylic rods allow high light transmission and optical clarity. Acrylic rod, although strong and visually impressive is an inexpensive material due to its economic production process. Extruded acrylic rod can be fully recycled.